Realistically however, it is not the future of journalism, but it is certainly part of it. Journalism, as an industry, is suffering; the decline of print media, the decreasing newsroom budgets, the demands on journalists and the ongoing debates over paywalls and online advertisement. The future is online, but the form it takes is not as certain. As soon as the tweets promoting Snowfall as the future of this ailing industry began, so did the counter tweets, claiming that no, it is not. To pick up on a couple of the more pertinent points, the way the NY Times did the project was expensive, much more costly than any smaller news organisation could hope to plunge into a single story. Secondly, the time consuming nature of it (it took 6 months to complete) meant the piece never had a chance to be groundbreaking, recent or exclusive. Another point that I feel should be included is how can this be “the future of journalism” when there is no way this concept would work for the majority of stories, regardless of time and money. Not every piece of news lends itself to the interactive, multimedia treatment and it’s certainly not what I would want to be greeted with when I accessed an online paper. Words are still powerful, regardless of whether they’re on a screen or on paper, and for me text-led pieces aren’t going to be replaced any time soon. Rough Ride the story of North Dakota’s oil production, a big story told on a micro level, focusing on personal stories which worked together to build a bigger picture. Created by Todd Melby, the multimedia experience is split into chapters, each with additional scenes and extra content which the user can direct themselves through at their own pace. Built in Zeega, this project is part of a larger initiative called Localore, which assists public media channels on a local level – check out some of their other projects here. The interactive documentary, which sits within Melby’s main project ‘Black Gold Boom‘ is the perfect example of how interactivity can work for journalism. The story remains timely as the impact of North Dakota’s rapidly expanding oil country is still being felt and it is built within an open, free and accessible platform. Produced by NPR and the winner of a number of multimedia and innovation awards, Lost And Found: Discover A Black-And-White Era in Full Color, tells the story of 1930s-era photographer and hobbyist Charles W. Cushman. Originally the photos were intended for a blog post, but with the audio from the interviews as well, the production team from NPR decided to make it something much more. The combination of audio and visual is very powerful and speaks volumes about the potential for interactive experiences within radio journalism. Again it was built within Popcorn.js, another free and open source platform, which allowed the developer working on the project, Wes Lindamood, to create something that could be updated, downloaded and viewed on any kind of device. Back in 2009 The Guardian launched a couple of interactive documentaries, first ‘When was the internet invented? A people’s history of the internet’ which was a bold and innovative step to take. However, it was a shame to see that The Guardian didn’t follow up with anything else until Firestorm this year. 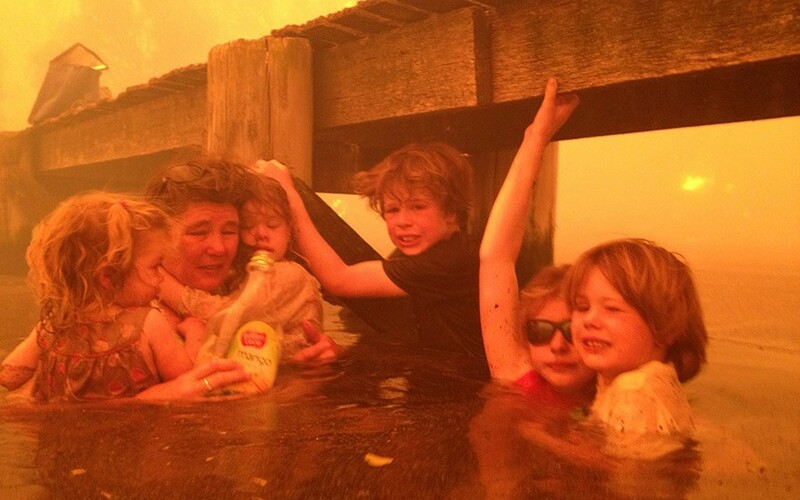 Produced to coincide with the launch of Guardian Australia, Firestorm utilised HTML5 along with some incredible imagery and powerful sound to tell the story of the Holmes family, whose iconic image during a Tasmanian bushfire spread around the world. Although the Guardian regularly produce interactive content, it’s exciting to see something done on this scale and it certainly drew me in. This is where interactive documentary comes into its’ own; the forms, particularly within journalism, are still largely undefined, new technology is continuously altering the landscape and the outcomes are still framed as innovative and intriguing. This is the time for journalists to embrace this still predominantly unknown genre and run with it. Another avenue interactive documentary lends itself to is citizen or participatory (or any of the other names for it) journalism. Jonathan Harris’s platform Cowbird played host to Sandy Storyline, a collaboration of the MIT Center for Civic Media and Housing is a Human Right. The storytelling project, which was set up in the wake of hurricane Sandy, asked members of the public to send in their stories via mobile tool, Vojo. The project has now become a rich participatory documentary, providing a first-person account of the aftermath of hurricane Sandy which the user can explore at their own leisure. Much like Hollow, Sandy Storyline maintains continuous links to the community and relies on grants and donations to fund education programs, host community exhibitions and organise events to involve ever more storytellers. This and the other examples I have discussed, demonstrate collaboration is the key – whether it’s with other organisations or utilising existing platforms, making steps into interactive documentary is unlikely to be a lonesome venture. With this in mind, this summer will see the NFB and NYTimes Op Docs series collaboration A Short History of the Highrise – a collection of short interactive documentaries directed by Kat Cizek – released and it would be great to see more initiatives following in their footsteps. However, it is important to remember than traditional, linear storytelling still has it’s place and always will. Just last week the NYTimes released Hannah’s Story, an incredibly powerful documentary about drug addiction and domestic assault, which I sat and watched uninterrupted for almost 20 minutes – a long time in the world of the internet – I was captivated. This is the crux of the issue, there is no all-encompassing “future of journalism” and reproducing Snowfall or any of these other examples with different stories is not going to go down well. The crucial element here is experimentation. One of the biggest issues at the moment (aside from advertisement problem..) is how to get people to pay; the sheer magnitude of content on the web means the majority of the time there will always be the same story, somewhere else, for free. However, engaging, immersive, interactive web native content could be that element of “next-level” journalism, which stands out as original and works hand in hand with quality, investigative journalism. It may even prove to be something people will pay for. The Guardian’s developer blog provides this great rundown of the 10 things they learnt when producing Firestorm. 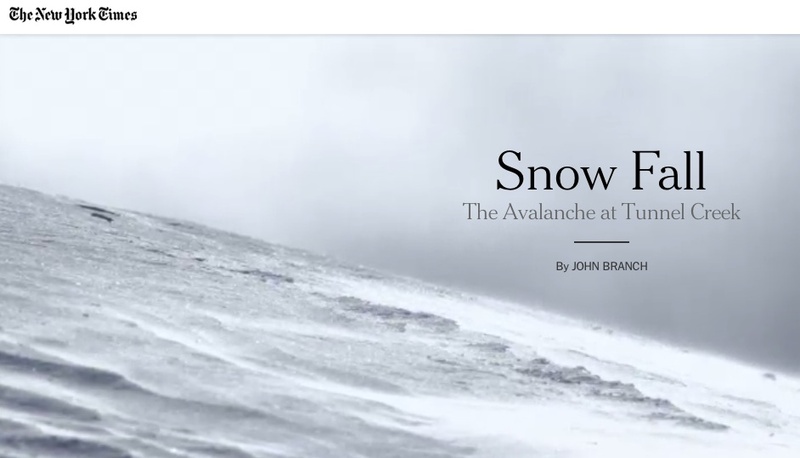 Web Directions have put together this list of 20 beautiful examples of snowfall style interactive storytelling. The International Journalists Network explain how journalists can use the interactive storytelling tool Zeega. i-Docs alumni Eva Dominguez curates an interactive and immersive journalism scoop.it which is full of good examples. The Nieman Journalism Lab discuss Rough Ride and the potential for innovation in local media.